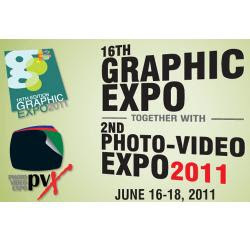 MANILA, Philippines - The annual Graphic Expo and Photo-Video Expo is back at the SMX Convention Center on June 16-18, 2011. Mark your calendar! Over 10,000 trade visitors (corporate and consumers) registered and visited the Graphic Expo 2010, back-to-back with The Photo-Video Expo. The Graphic Expo lives up to its reputation as the country's premier trade show and marketplace for professionals in the creative industries – graphic design, digital photography & video, digital imaging, pre-press, print production, large format advertising, sign making, out-of-home, web publishing, multimedia and animation industry. An exciting display of equipment, hardware, software, supplies, products, goods, and services, together with power industry events/forum/networking will take place in year's event! Graphic Expo is staged simultaneously with Photo-Video Expo as convergent state-of-the-art technologies present the exciting world of graphics, printing, photography, imaging, video and publishing! These twin events connect you with trade buyers, decision makers, businessmen, top suppliers, and industry professionals. It is an ideal trade show to expand business, meet serious customers, source for digital technologies and innovation, upgrade existing tools, and network with strategic industry contacts. The Graphic Expo and Photo-Video Seminar Series is where creative professionals harness skills and learn software applications that enhance digital work flow process. Attend the seminar and learn from Industry Experts!